Be part of the Unity 2017 blood drive at Unity on August 9, 10, 11 and 12. You can call 1-866-MIBLOOD to arrange your donation appointment today. You can also arrange your appointment online by clicking here. 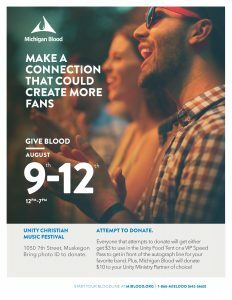 Your donation at Unity will not only help those in need of blood in our community but you will also be supporting Unity Christian Music Festival and our partner ministries who will benefit financially from every donation. As an added bonus you can select a special Unity bonus for yourself when you donate blood at Unity. · Unity Christian Festival Blood Drive Wednesday-Saturday noon – 7 pm. 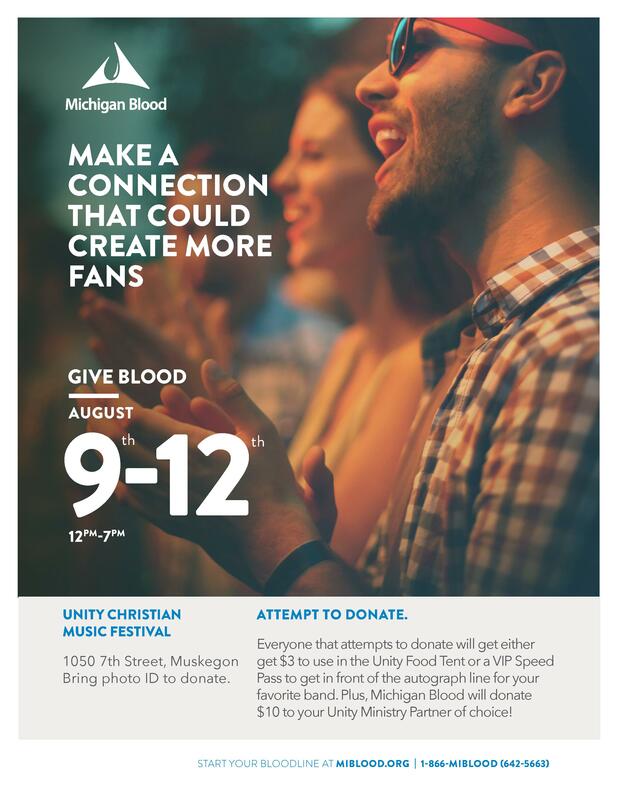 · For Every Person that attempts to donate, Michigan Blood will donate $10 to one of Unity Christian Ministry Nonprofit Partners. Help save a life and help our community at the same time. · Plus donors get their choice of $3 in Unity Food Coupons OR an Autograph Speed Pass that moves them to the front of the autograph line for an artist of their choice. · Must be 17 yrs old to donate or 16 yrs old with parental consent. No Unity ticket required to donate. Click here to download and print a promotional poster for the Unity Blood Drive.